I’m not exactly sure what constitutes homeschool success, but I do have a few goals that I’ve jotted down over the years. One of the things that is written across the top (and in bold) is that I want to raise a houseful of kids who love to read. Is it possible to raise a family of readers? I certainly hope so, and I’m definitely trying. These methods seem to be working well for my oldest child, Curly, who just turned 11. Curly has become quite a bookworm. Yes, I’m very proud! She’s amassed a rather large book collection and her bookshelves in her room are starting to overflow. I asked her to go through her books and do a little organizing, and when she was done I asked her to share some of her favorite reads from this past year. She had a hard time narrowing it down to just a few books, but here are her top 12 favorites. This book is filled with secrets – namely the secret of a magician who has disappeared under suspicious and stinky circumstances. Two children must use the box of vials that contain the Symphony of Smells to solve the mystery and unveil the secrets. There is an entire series by this author. Children are recruited to take unusually and challenging tests and in the end, only four are chosen for a top-secret mission. These children must go undercover at the Learning Institute for the Very Enlightened where their friendships and abilities will be tested as they uncover many secrets. Every Tuesday the castle undergoes strange and mysterious events – the castle moves and changes and even gets rid of rooms. One girl takes the time to map all the changes. Her information comes in handy when the castle is ambushed and she must save the kingdom. Fall into a world of fairy tales! Two children find themselves in the middle of stories they’ve only read about. They must face witches, wolves, goblins, and trolls as they try to find the way back home. The prince is to choose his bride from among the village girls, so the king sets up an academy high on the mountain. All the girls must attend to learn more about becoming a princess. The competition is fierce, but one girl discovers a special gift and puts competition aside to save the other girls from harm. Sophie is lost in the snowy blizzard of the Russian countryside until she is rescued by a beautiful princess. She is taken to the winter palace where she is surrounded by mystery. Was she rescued from the snow just to become a prisoner of the palace? Persimmony thinks she lives a boring life on her island home until she overhears a strange secret. Her rising and falling island home is actually the belly of a sleeping giant. It’s up to her to convince the other islanders to keep quiet and avoid waking the giant. When the brave and adventuresome Princess Meryl becomes gravely ill, her shy sister must embark on a dangerous quest with dragons and magic in order to save her sister and ultimately save the kingdom. Poppy has inherited a special power – the power to be a witch (a good witch, that is). However, she wants nothing to do with her special power, she’d rather be a baker despite her parents’ wishes that she become a witch. She hatches her own plan to achieve her dreams of becoming a baker. Take a peek inside the diary of a pre-teen girl’s diary. Living in Spooner, Wisconsin seems like it would be boring. However, young E.J. seems to find lots of adventure while learning many life lessons along the way. The villages’ beloved storyteller is kidnapped by soldiers of the Chinese emperor. Everyone knows the emperor is searching for the Luminous Stone. In order to rescue the storyteller, two children begin a fantastical journey to find the stone and exchange it for the elderly storyteller. An enterprising 6th grader thinks he can make toothpaste cheaper than the kind he buys at the store. He develops a production plan and by his 8th grade year has made more than a million. It’s a book filled with math, business plans, and inspiration. Now that my girl has exhausted the reading supply on her bookshelves, I’m off to search reading lists and book recommendations to find new titles for her. I’ll never be able to keep up! I hope that Curly’s list of favorites gave you some inspiration for your own readers. Always keep them supplied with baskets and shelves full of books! What are your kids’ favorite reads right now? I’d love to hear what’s on your reading list as I hunt for new titles for my kids! And if you’re still struggling for inspiration, might I suggest a few more resources to get you started on the adventure of choosing wonderful books for your family? First, you can sign up for my newsletter in the sidebar and receive a copy of Lextin’s Library which is a giant collection of book lists from Preschool through 5th grade. 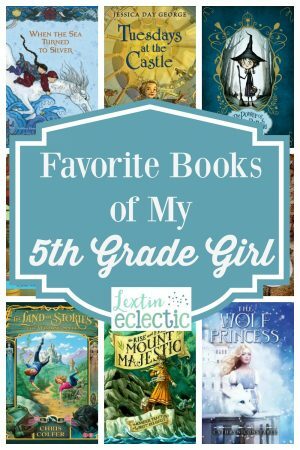 For a quick preview, you can view the entire 5th grade reading list on the blog. You can also check out these books for more book ideas! my son LOVES the warrior cat series by erin hunter, and the unwanteds, and journey to Dragon Island. I don’t know if your daughter…but those books I can’t drag him away from. 🙂 Oh.. and currently “a Wind in the door”. Thanks for those ideas! My daughter has a couple of friends who are reading the Warrior series. I’m not sure my daughter would enjoy those but I know that my son would. And I haven’t hear of Wind in the Door. I’m going to have to check that out! I’m always looking for new book ideas. They love to read! We loved the Tuesdays at the Castle series. My 3rd grader is an avid reader, so I try to keep up with her….saving this list for our next trip to the library! I hope you find it helpful! Yes, that is a wonderful series! It’s a huge favorite at our house. I want to look into the Wilderking Trilogy next. It was recommended to me and looks really good!